Housed within the striking glass, steel, and concrete structure on Inner Harbor, the Maryland Science Center contains five storeys of interactive exhibits, an IMAX, the world-famous Davis Planetarium, and an observatory. Dating back to 1797, he Maryland Academy of Sciences is one of the USA's oldest scientific institutions and remains focused on education. 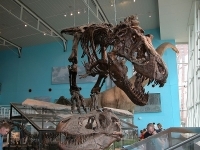 There are imaginative and hands-on displays ranging from astronomy and space travel, to dinosaurs and general science experiments. The planetarium runs programs with stargazing at night and studying the sun during the day through the observatory telescope. Other popular attractions include The Kids Room and the National Touring Exhibit. Opening times: Monday to Friday 10am-5pm, Saturday 10am-6pm, Sunday 11am-5pm.